Laws designed to protect the environment are multiplying, but the decline of biodiversity accelerates–an untenable situation that University of New England (UNE) law professor Paul Martin is investigating through new research alliances with Brazilian universities. Globally, Professor Martin reports, there are 130,000 environmental laws and over 2000 environment-related treaties, as well as a constellation of private standards, codes and other initiatives. This week, Prof. Martin left for Brazil to sign agreements that will enter UNE into an ambitious research alliance investigating better ways to protect the rural environment, with a lower economic burden. One intention, Prof. Martin said, is to create more self-sustaining forms of governance that rely less on regulation, but strengthen the use of social and industry rules and take a more sophisticated view of human behaviour. UNE is signing MoUs on the project with UniCEUB, Brazil’s third-largest university, and Mackenzie Presbyterian University in São Paulo. 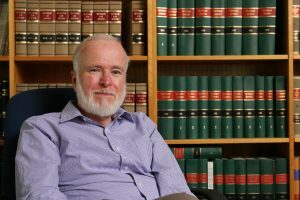 Paul Martin, Director of the Australian Centre for Agriculture and Law at UNE’s School of Law. The alliance will build on an earlier multi-nation project led by Prof Martin, which developed a framework for assessing the effectiveness of environmental law. The framework has been initially applied to evaluating the performance of environmental laws in Australia, Brazil, China, South Africa and New Zealand. The results, published by the Environment Law Centre of the International Union for Conservation of Nature (IUCN) in Bonn, Germany, highlighted numerous shortcomings in environmental governance, and proposed a number of improvements. Some of those ideas will reappear in the work of the UNE-Brazil alliance.Prof. Martin has had a long-standing professional interest in governance reform that better enables agriculture to flourish, while reducing avoidable damage to the environment. He leads a national project for the Invasive Animals CRC to improve policy for managing pest animals, and he leads a team at UNE that has worked on issues like native vegetation legislation, landscape connectivity and weed control. Although Brazil may not be a country foremost in Australian minds, Prof. Martin has spent seven years cultivating research connections there because he believes that in important areas, Brazil is a close global counterpart to Australia. Building better regulatory systems is only a first step, Prof. Martin said. Good ideas only matter if they are picked up and put into practice. Prof. Martin will be in Brazil until mid November to sign the MoU’s with UniCEUB and Mackenzie. The agreement will include the exchange of doctoral and post-doctoral students to provide a perspective on natural resource governance in countries that are very different but face similar challenges to their own, so the students can work with a different political, cultural and legislative environment.